How many times before did I say I love Tweetie? Both in its Mac and iPhone versions, I think it's the best Twitter client out there, even better than many "professional" online services. Read my article "10 Reasons Why You Should Buy Tweetie 2..and What To Expect From Tweetie 3" if you missed it. Today I had the chance to chat with the man behind the revolution, Loren Brichter. 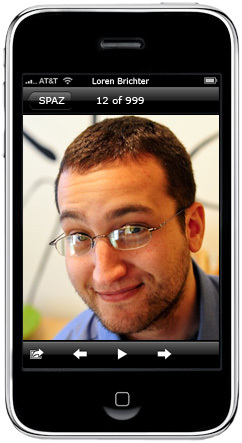 He works at atebits and he's the developer of Tweetie. Enough said, time for the interview! - Hi Loren, thanks for giving me the opportunity of this interview. 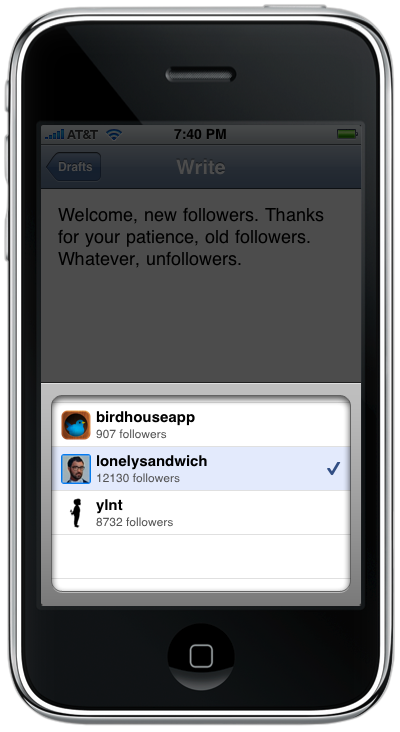 So, Tweetie 2 is finally out in the App Store. Has the feedback been good? Are you satisfied of what you acheived with this big update? I couldn't imagine it going any better. People love it, the feedback has been overwhelmingly positive. There are of course those few niggling issues (despite the 2.0, it's a 1.0 at heart), but I should have them fixed for 2.1 which is just about finished. I put a ton of work into 2.0, when I was developing it I didn't take any shortcuts. There are probably more "little" features in there than any one person can discover on their own. It's built for the future, should make adding new features and adapting to changes on Twitter's end much easier. - Many people complained about Tweetie 2 being a paid update, but I believe it's totally worth it considering the complete rewrite the app went under. Was this a difficult choice for you? Extremely. I saw it coming months ago, and had been talking to Apple about a discounted upgrade mechanism for the App Store for a while. Sadly it wasn't finished for the launch of Tweetie 2, so I decided to bite the bullet and go with the "whole new app" route. Most people who have tried 2.0 would say $2.99 is a steal :). - Apple just announced the In-App purchasing system available for free apps as well. Your thoughts about it? It's fantastic. From this point on I think every dev should consider going the free route with an internal paid "activation" mechanism (e.g. trial -> full version). It's too late for Tweetie 2, but I'm definitely going to consider it for future apps. - What should we expect from Tweetie's future updates? Lists..and? Yep, lists, and native API retweets, geotagging, and a bunch of little things I can't share just yet. Rest assured, I'll be busy for a while. - Let's move to the Mac platform. We know you're hardly working on Tweetie 2 for Mac. Will it be a complete rewrite too? Nope, my goal with Tweetie 2 for iPhone and Tweetie 2 for Mac was to bring the codebase for both in sync. Tweetie 2 for iPhone was based on the new core I wrote for the Mac version, and now all the fixes and improvements I made while bringing it down to the iPhone are going to migrate back up to the Mac. Not a rewrite, more a "revamp". - Are you gonna add sync options between Tweetie 2 iPhone / Mac like 1Password does? That's not planned - more important is syncing "read" state between clients, which is planned. - You once said on Smoking Apples (http://cld.ly/3d2jv) you were working on a "big Mac graphics app". Is the project still alive? It's in a coma. Not "technically" dead, but I won't have time to work on it until Tweetie stuff calms down a bit. - Can you please tell us something about your workflow, favourite apps, online services..? Xcode, Textmate, Photoshop. Couldn't live without any one of those apps. I use Things, and just recently set up a Lighthouse (and Lighthouse Keeper) + Tender account which are working out great. I ditched Git and started using Mercurial for source control. No incomprehensible quirks (yet) put it a step above Git in my book. Dropbox is probably my favorite service of *all time*. I pay for the giant one and keep my entire Lightroom library synced in it. - Thank you Loren for chatting with us. We wish you good luck with every project you're working on. See you on Twitter!